I am delighted to note that, exactly 10 years ago today (on Monday, 20 April 2009), this website was formally launched. Our school community has seen a huge amount of (positive) change in that short decade but the one thing that has not changed is the school’s unwavering commitment to our children’s education, delivered with a healthy blend of fun along the way! Not only has the website delivered on all 4 of the original goals, but one of them is no longer required at all (to our great relief), and so we can now look forward to focusing our efforts on delivering the other three instead. Thank you for being a part of this journey and a part of the school’s history for several decades to come! Comhghairdeachas do fhoireann shacair na scoile a bhuaigh craobh comórtas sacair Roinn B FAI na scoileanna i bPort Láirge. Rachaidh siad ar aghaidh go comórtas na Mumhan a bheidh ar siúl i Luimneach an mhí seo chugainn. 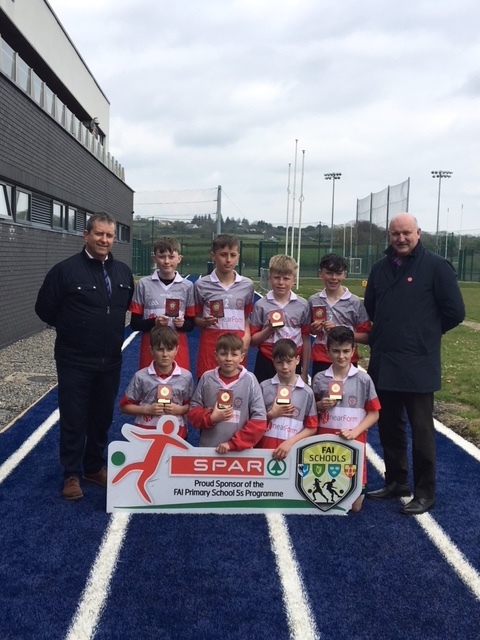 Congratulations to our boys soccer team who won the Section B FAI Waterford schools final recently. They will now represent Waterford in the Munster championship blitz to be held in Limerick next month. Those parents who wish to purchase their own books separate to the scheme should inform the office but will still have to pay costs associated with reading resources, art, craft and photocopying of €50. All payments can be made in instalments to the school office. Congratulations to Sixth class and Múinteoir Ben who have won through to the final of the All-Ireland school’s drama competition in Mullingar on April the 8th next. Their play “Síofrógacht” was first performed at the school christmas concerts but since then they have travelled to Carlow, Ring and Fermoy with it. Great acting and drumming have won them plaudits and prizes. 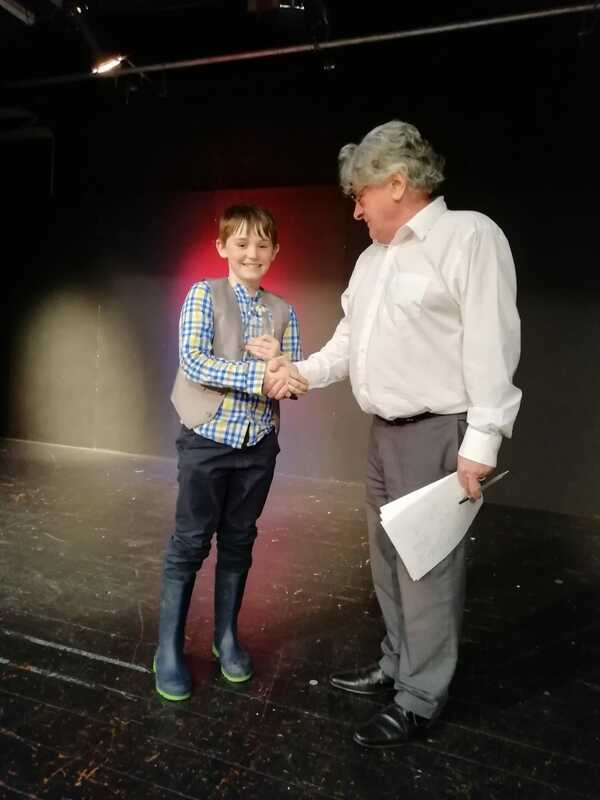 Our picture shows Josh, a sixth class pupil, accepting a prize for best actor at the competition held in Ring recently. Best of luck in Mullingar! The latest school newsletter (March 2019) is now available on the Newsletters page. The latest school newsletter (February 2019) is now available on the Newsletters page. The latest school newsletters (January 2019) is now available on the Newsletters page. The latest school newsletters (December 2018) is now available on the Newsletters page. Sixth class have been busy gathering money for three charities. “We asked everyone to bring in shoe boxes with nice things like sweets and toys in them. The boxes have been sent on to places like Rumania and Africa”, says Aimí from Rang 6. We also had a cake and book sale last month and raised money for “Make a Wish” and the St. Vincent de Paul. The latest school newsletters (November 2018) is now available on the Newsletters page.